Hi everyone and welcome to the next challenge at Digitally "Sweet" Challenges but before I tell you what it is I would like to thank all those of you who played along with our last challenge. At this rate it will be Christmas before you know it! I would also like to remind everyone that this is a totally digital challenge - 100%. I have used a digikit from Crafty Secrets plus some frames from the Daisy Trail kit Frames and Corners. The pumpkins were a photo of the ones my husband made and cut out using CAP2 cut out studio which I love to bits. Don't forget to check out my teammates creations - their links are on my left sidebar. One Stitch At A Time Challenge - Boo. Hugs and don't forget to leave me a comment. Love this Ali!! Great pics too!! Great layout hun. Lovely piccies and wow, soooo many challenges. Lovely way to preserve a special set of memories. The detail of this layout really adds to the fun. Great pics of the kids with their amazing painted faces. 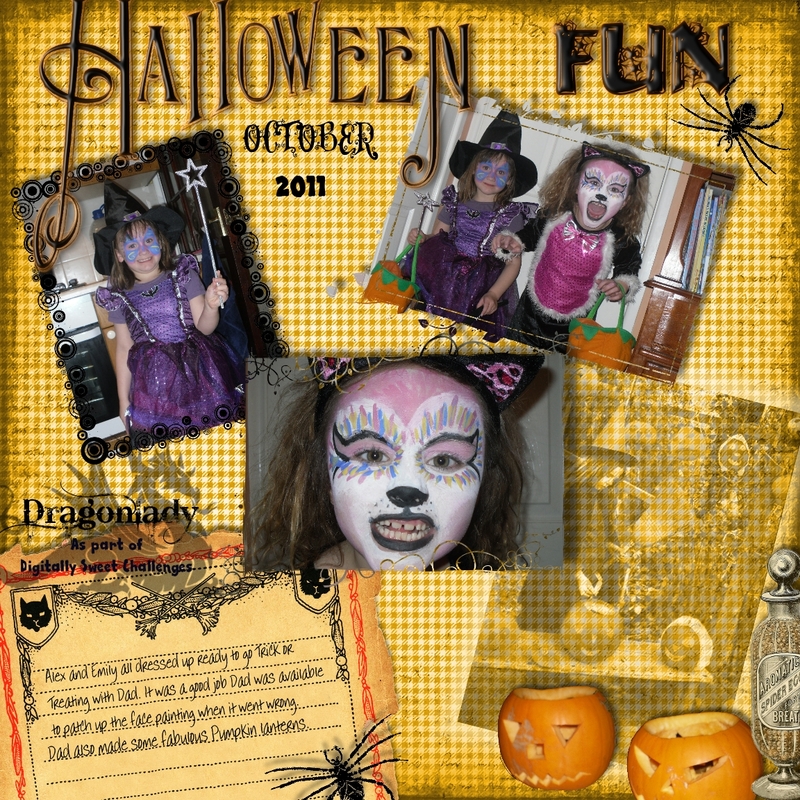 Thanks for linking up to our Halloween challenge at Art With No Boundaries. Join us again soon! This is so lovely. Looks very nice. 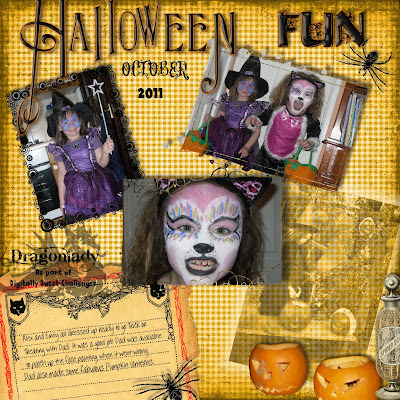 Love your inspiration from the photo....awesome photos too....I always love Halloween pages and they are so much fun to do! Great project and I love the photos too! Fabulous layout!!! Just love this. Thanks for joining us this week for Stitchy Bears's BOO challenge! Hope to see more of your goodness in next week's challenge! What a great scrapbook page. 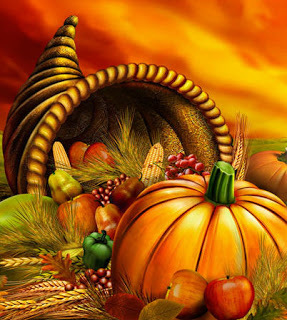 Of course the girls steal the show, but your papers and those great pumpkins make this really specia. Great job. Thanks for joining us at Can You Digi It? Lol I used that same pumpkin image from Google just last week on my daughter's homework poster!! Smiles.. Thank you so much for joining us at Penny's Paper Crafty for our Anything But A Card Challenge. Ali, such a FUN LO and memory! Very nice layout! bravo! thanks for playing with PPC. What a fun layout! I just love Halloween! Thanks so much for playing along with us at Can You Digi It? this week! Amazing what you did digitally! Fab layout. So glad you linked up at Art With No Boundaries!